The true power of our projects come from the people we meet and the stories we’re able to share. 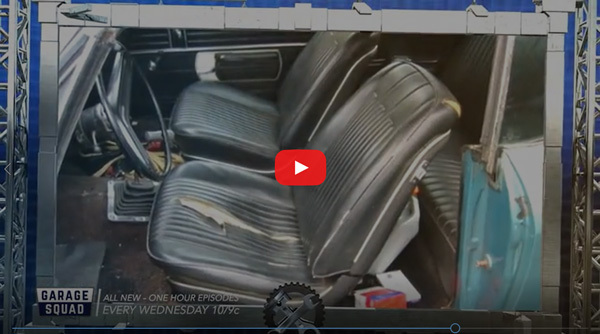 This week the crew takes on a 1968 Malibu, restoring it as a tribute to Brandon, a USMC Iraqi War vet who succumbed to the effects of PTSD four years ago. A lot of heart went into helping Brandon’s family restore the roar to this vehicle he’d planned on rebuilding with his father. You’re invited to tune in Wednesday to watch the #GarageSquad flex this American Muscle for an American hero. We also hope this week’s episode can help raise awareness for members of our Military that may be dealing with PTSD on their own. There are many wonderful resources available, including the Road Home Program: https://roadhomeprogram.org where help is always a click or call away. WATCH: Brandon’s family asks Garage Squad to fulfill his dream of rebuilding his ’68 Malibu. What a great episode! Very touching. Kudos to the Garage Squad for such a nice tribute to a true American Hero. God Bless Brandon and his family. Thanks for the comment Daniel. It means a lot. I never respond to programs bur the last episode on the 68 Malibu was by far the best! Your show is so awesome, my favorite! I am a big fan of muscle cars and always have been. I am 53 and your show makes me a kid again, thank you and keep it up please! Thanks Robert. And thanks for supporting the show. Hey garage squad yall are awesome that episode I just watched was awesome. Yall are great poeple and thats badass what yall did for that marines family may he rest in peace. To the family thanks for sharing the story of your son and thank you for having a son to fight for his country. Awesome show yall been a fan for awhile. Yall are awesome thank you again. Thanks for the reaching out Joanne. Thank you for the comment. Garage squad I salute you for your effort in getting one of our devildogs classics back in the game…ooohhhrrraaahhh!!! Thank you Robert! And thanks for supporting the show. This was one of the greatest things I ever witnessed. What you all have done for this family in such a great way will come back to you tenfold. I was even teary eyed watching. The car looks amazing and sounds so cool. To the family, thank you for supporting Brandon in his service to this country. I’m sorry you lost him so soon but as Momma said, he’s living again a little bit in that car. Thank you for your message Erik. I would like to thank the Garage Squad for not only doing this car for Brandon and his family but for bringing some attention to the real problems brought about PTSD. As a member of the military medic community for the last 17 years with deployments to Iraq, Afghanistan, etc., I have seen many things. PTSD is real and for some it becomes too much to handle, no matter how much support their family and others provide. Thank you for the comment Jon. This episode meant a lot to us. You Guys & Gal ROCK! As a former member of the Military & seeing combat in Viet Nam, it was Heart warming to see all of you paying tribute to this fallen Marine! My wife & I send our Prayers to the Family along with many more that were missed by the VA Hospital, but you have to say something to be noticed! It took me 47 years to go there for other issues and they do HELP! Thanks to ALL of You at Garage Squad, we Love You for what you do! We appreciate the message Richard. This means a lot to us. Thanks for supporting the show. I’m a Viet Nam Vet and I have had Chronic and Severe PTSD since the late 70’s. I watched this episode and it touched me DEARLY. I feel for the young marine that had so many demons to deal with he made the choice of ending the battle. I truely feel for his family too. I appreciate your crew doing this episode. My wish is tgat this country takes PTSD more serious. Thank you for taking the time to write Rod. We read all of these comments and they mean so much to the whole Squad. As a Vietnam Marine, and also someone who has followed your series from the beginning – this was your best show ever. Excellent work for a very deserving family. Thanks for keeping that young hero’s memory in the spotlight! Phil we appreciate your message and thank you for supporting the show. You guys rock! Thank you for helping the family of one of my brothers in arms. I mean it from the bottom of my heart. Thanks for the comment Anthony! We appreciate it. I just watched this episode. What you guys did for this family is out-freakin standing!! Talked to Wendy, sounds like Ronnie and Kingster are a couple of stand up guys! Brought tears to this old Jarhead! Thanks Ron. Glad to hear from you. Love your show and the “In Memory Of A Marine” episode was your best. I’m sure it brought a tear to your eyes as it did mine. Thumbs up group! Looking forward to the next episode!